Terrie Lloyd is a Tokyo-based New Zealand and Australian dual national who claims to have started 27 companies in Japan. He came to Japan in 1983 and set up a successful outsourcing business that was sold to EDS. He started a technology magazine, called Japan Inc, which failed. In 2007, he bought Metropolis magazine from its founders, Mark & Mary Devlin, but reneged on paying them for it. He has since engaged in multiple frauds to hide his assets from the Devlins. MetroWorks receives an unspecified amount of funds from Sunbridge Global Ventures, a startup VC fund run by ex-Oracle Japan CEO Allen Miner. The startup ‘s Atsumare CQ helps web administrators easily manage group development work among content creators. Metropolis magazine is taken over by Japan Partnership KK. According to a later interview, Lloyd says he “relinquished control” over his interests in Metropolis’s printed edition in October 2012, and while the same management team publishes the paper magazine, he is no longer the publisher. However, an investigation by Mark & Mary Devlin, the previous owners of Metropolis, reveals that Japan Partnership KK is not an independent company, but was in fact bought by Lloyd from its previous owners, Richard and Lucy Marshall. Lucy and I sold our in-active company to Terrie late last year. We have no involvement in any of the matters you are suggesting. The Devlins find out that the main shareholder of Metropolis is David Wells, Lloyd’s business partner in Hong Kong. Lloyd continues to control the company through Wells, Neil Butler his COO, and Frank Kasala, a CEO who has no experience in publishing, and who no-one in the Metropolis office has ever met. Even though Lloyd says he is no longer the owner of the business, in December 2012 — after he has supposedly relinquished control — he still actively solicits investment for the magazine. Metroworks, a spin off of Metropolis magazine technology resources, is founded by Lloyd and Neil Butler. Butler is CEO, Lloyd is COO. David Wells is the main shareholder. 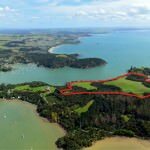 In two articles in the New Zealand Herald [Gallery] Lloyd says he is selling his 16 hectare (39.5 acre) beachfront property. 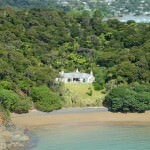 The property near Manganoui, is close to Doubtless Bay, four hours north of Auckland. According to the report, some of the proceeds from the property sale will be used to help fund business opportunities the Japan. As you can imagine with the post earthquake the banks aren’t lending a lot of money so whereas a year or so ago I could have just gone out and just simply raised the money locally I’m finding now that liquidity is much tighter. In an interview for The New Zealand Herald, Lloyd talks about working in Tokyo, while his family stays in New Zealand. He spends a week each month with his family near Kerikeri. He also talks about losing almost losing his ‘fortune’ in the dot-com bust of 2000. It was a pretty ugly time. Even my wife told me to go and get a proper job. That was probably my low point. After publishing over 700 issues, the Devlins sell Metropolis to Lloyd, a New Zealand and Australian dual national, based in Japan. Over 14 years the magazine has grown to over 80 full-color pages every week made by a team of 35 staff from all over the world. The magazine has annual sales of ¥360 million and 20% profit, from hundreds of display and commercial classified advertisers and is, by far, Japan’s No 1 English magazine. A brief history of Metropolis is here. Make a profit, and have mutual respect. Sells LINC Computer to EDS for an undisclosed sum. At the time of the sale LINC has annual sales of $18 million. Starts an outsourcing business called LINC Computer, which Lloyd claims is the first foreign-run IT company in Japan specifically servicing other foreign firms. Arrives in Japan on a working holiday visa. Soon after, with his wife, he establishes his first company, LINC Japan Ltd., to provide translation and copywriting services. Age 19, Lloyd moves to Australia, where he works in computer-related business. Leaves high school at 16 and works in the Pye plant in Waihi as a TV repairman’s apprentice. Born in Helensville, New Zealand, and raised in Tauranga.